Last week, I had the daunting (daunting because I know my way around a suit shop like the average girl knows her way around an auto-parts store - and that's not sexist, that's just realistic) task of picking up John's suit for hire (that's "rental" for all my American friends) for his best friend's wedding at Moss Bros. in Covent Garden. I huffed and puffed my way through slow-as-heck tourists and negotiated a path past those I'm-a-statue-but-I'm-a-real-person! street peddlars artists all the way to Longacre Street from The Strand, only to call John, visibly annoyed: "I can't find it," I snapped. "You said it was across from H&M and I'm standing at that very spot now." "Ohhhhh ..." John said, sounding faraway in his glass-windowed tower of an office building in the City. "I think it's actually on that road by HMV ..." he said, his voice drifting off. I hung up without saying goodbye and huffed and puffed my way back around again through the slow-as-heck tourists and street artists, finally stomping into Moss Bros. When I eventually located the damned suit hire counter (because their staff is useless at customer service, for the record), I was met by a sour-faced woman who slowly plodded off to fetch the said suit while I waited for 15 minutes in air-conditioned coolness on a leather chair that was so big, it made me look about 5. After being informed (to my great displeasure) that I would have to pay the remaining balance on the suit, I just about lost my temper until the sales assistant took an inventory of the contents of the suit bag in front of me. "One long jacket with tails," she said aloud, pulling out the grey tweed jacket and matching button-up vest, which looked dapper-as-heck. "Oooohh!" I said, as my mood was instantly lifted. "One cravat," she pronounced, pulling out the seafoam green silk. "OOOHHH!" I said, slightly louder, to her delight. "And one top hat." Whoa, whoa, whoa. Rewind. What did she just say? "One grey top hat," she repeated, replacing it in its hat box. My heart swooned. Then I envisioned John in the top hat and giggled. See, this is what I love about (the majority of) the English. Everything is so formal and proper. There are traditions and there is etiquette. Even builders take their tea breaks. I, unlike a lot of people, love formality for formality's sake and I've been to a couple of American weddings where the bridesmaids wore flip-flops and the groomsmen wore sneakers. They were admittedly cute, low-key, and casual ceremonies and receptions but lacked the gravitas . However, I just don't think the English do "casual" (except for a certain selection of the population, but I'll get to that another day). I was super excited to attend a wedding that would include top hats for the gents and (hopefully, but probably) fascinators and hats for the ladies. 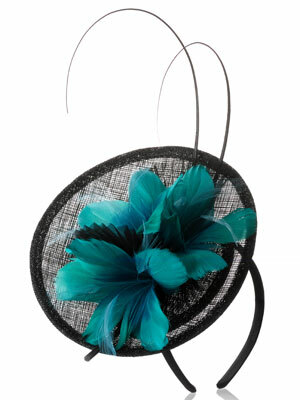 Above all, I love fascinators. They're something we definitely don't do in the States and thus, something that screams "British" to me, like tea and scones with jam do. I've never had the guts (nor had an occasion) to wear one, but I love seeing them on ladies here in the UK - whether it's at Ascot, a wedding or a party. There's something so dignified, yet completely crazy (just google "fascinator" images and you'll find some insane creations) about them and headwear as an accessory always receives an exuberant "yes" in my book. At Tom and Danni's gorgeous Yorkshire wedding this past weekend (just check out that amazing flower arrangement above), I saw a lot of wonderful fascinators (and hats for the moms) and instantly wished I had braved one with my dress. I think I'll gradually work my way up with some feathered headbands as recently seen in Accessorize before taking the plunge. I think I've seen something approaching a "fascinator" on girls going to the prom... but, yeah, the closest thing women commonly affix to their head over here is probably the *shudder* bump-it. Quinn! (I totally owe you an email) What is the "bump-it"??? I'm baffled.